The Asian University for Women (AUW) is a beacon of hope for women across South and Southeast Asia who aspire to learn and grow and become global citizens. Never was that more apparent than last night when the Japan support committee of AUW held their annual film event in support of the university. 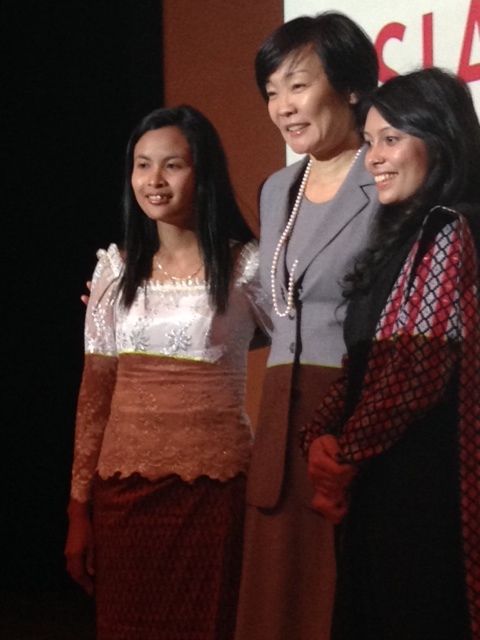 Not only did the group show the inspiring documentary film “Girl Rising” about the critical importance of education for girls in the developing world, but two students who graduated from the university in their inaugural graduation in 2013 came to Tokyo to address the crowd and show first hand what an education can do. taking in laundry to finance her daughter’s education. Kamala talked about how she not only had to walk 90 minutes each way to get to the closest high school, but had to work full time teaching the primary grades as well as complete her own studies in order to finish her secondary degree. Both girls passionately spoke about their time at AUW, the joy they found in learning, their hunger to become global citizens, and the golden opportunities that higher education – in English! – has given them. Currently Kimsru works for a nonprofit organization in Phnom Phen, teaching kids about practical life skills and urging them to stay in school. Kamala is pursuing graduate education in South Korea. 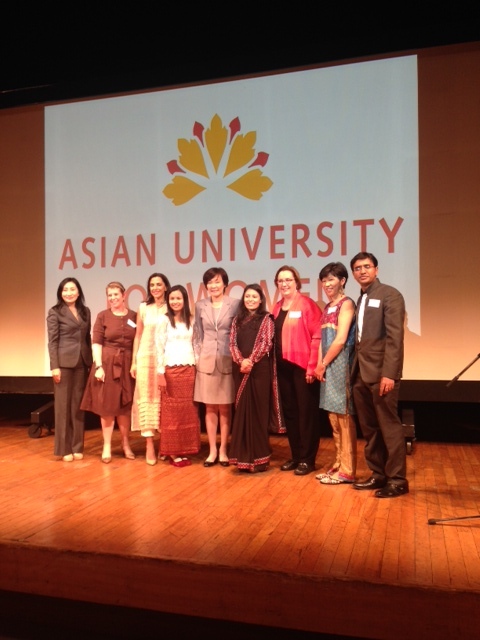 AUW has a place on the global stage, as evidenced by the commitment to the school by Japan’s First Lady, Akie Abe. Mrs. Abe took time out of her busy schedule to meet the girls and left a message to be played for the entire audience where she discussed her own visit to AUW in Bangladesh in 2011 when was so impressed by the school, its programs, and the girls themselves, that she agreed to become a patron of the university. She urged others to similarly support the school and education for women. There’s more information available about the school and its extraordinary programs on their website. Please go look at it; you can’t help but be touched and inspired by it. I have written before about AUW, in 2010, and 2013. Both times I told you how truly amazing the girls are and how touched we are as a family to have the experience of interacting with these amazing young ladies. This year was as special as years past, perhaps more so because of our own recent life experiences. My daughter Sydney is wearing her new t-shirt today, the one designed and sold by the ASIJ support group of AUW, which supported the event. She bought it with her own money and it reads, “She believed she could, so she did!” It’s a message of determination, of grit and of hope. Sydney wears it in support of those girls who are less fortunate than she is to have the spectacular education that she does. Sydney won’t forget, and nor will I. Together we can make a difference in the lives of young women across the globe.